When Ted Cruz gave up his bid for the White House, he took all his clumsy Simpsons jokes with him. But the 2016 presidential race isn’t exactly bereft of pop culture references in his wake—it still has a walking, talking (much to everyone’s dismay) nod to reality TV in GOP nominee Donald Trump, who’s still reeling (or sniffling) from his debate performance last week. Instead of prepping for the next debate, Trump’s been Monday-quarterbacking the week-old event and/or harassing beauty pageant winners online. 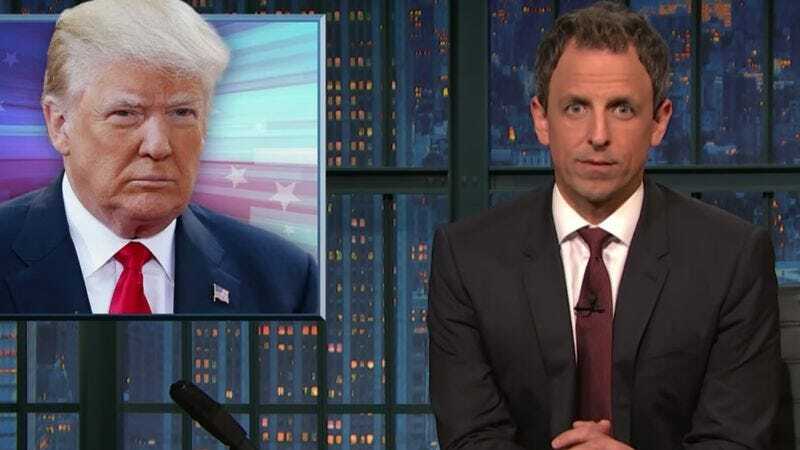 Seth Meyers focused his latest Closer Look on Trump’s Twitter meltdown, which was apparently begging for an infusion of The Dude. The Republican candidate was defended at the vice-presidential debate last night by his running mate Mike Pence, who’s either in denial of everything Trump’s ever said, or too busy dealing with his declining approval rating as Indiana governor. But Meyers focused on Trump’s other acolytes, including former New York mayor Rudy Giuliani and veep-wannabe Chris Christie. He gave Giuliani credit for his recent, unwitting impression of Jeff Bridges in The Big Lebowski, in which he huffed that a CNN anchor’s statements were just “opinions.” That’s not bad, but Meyers proffered this pithy bit from good old Walter instead. Now all we need is for someone to work in a “Second Chunce” reference at the next presidential debate.